Glorious sunshine bathed the gardens on the day of our visit to The Royal Landscape of Savill Garden in Windsor Great Park. Colour and perfume were to be found around every corner of this delightful garden. The Club's recent visit was in some respect an achievement to be remembered. Last year we had to cancel our visit due to lack of support. This year we did manage to attract a good number of members and friends keen to take the long journey to what is a magnificent garden. 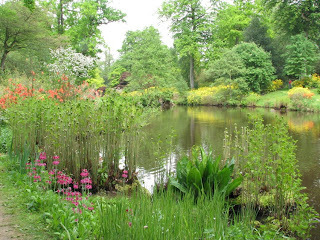 The Savill Garden was created by Sir Eric Savill, grand master of the woodland garden in the 1930's. Since then the garden has grown with the encouragement of the Royal Family, many of whom are keen gardeners. It is an all year reound garden but during spring is a riot of colour with rhododendrons, azaleas, camellias in abundance. So it was for us with many species releasing a sweet scented smell in the strong sunshine and high temperature experienced throughout the day. A few members managed to take the footpath leading to the Valley Garden, which is also situated within Windsor Great Park in what is known as Virginia Water. 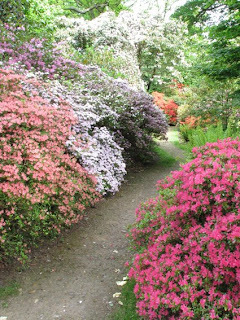 Here they were able to explore the magnificence of the Punch Bowl, an area planted on a hillside overlooking a lake with hundreds of rhododendrons and azaleas, creating a mass of colour. For refreshments and garden shop members were able to enjoy these facilities housed in the architectural wonder of the award winning Savill Building with its modern sweeping roof which blends superbly with the landscape. In addition the day featured a plant sale promoted by many well known garden centres and growers from all parts of the country. In all our visit was a superb experience, one not to have been missed.